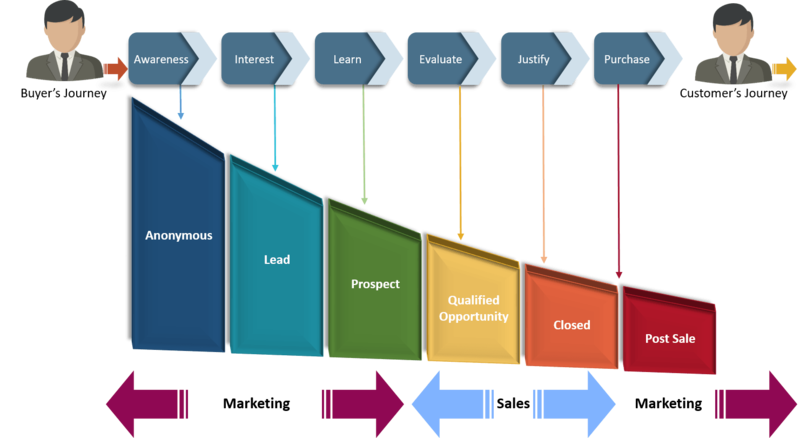 As the modern buyers’ values and habits have changed so have the juxtaposition of different stages in the B2B buying process within the sales and marketing funnel. According to Sirus Decisions, 67% of the B2B buyer’s research and decision-making process is accomplished online. As a result, there is seldom a need for early interaction between sales reps and the buyers. 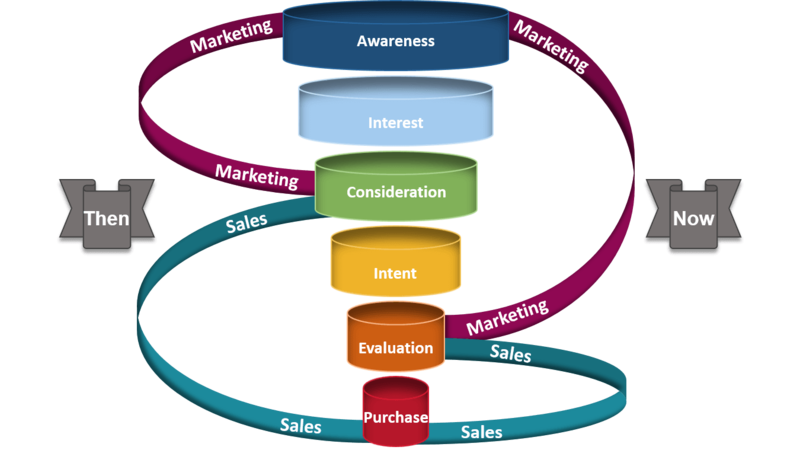 Consequently, sales interaction with the buyer now takes place much farther down the funnel. The already established divisions between the different phases of the funnel have now shifted resulting in uncertainty between the sales and marketing departments’ responsibilities. To accommodate the new changes in the buyer’s journey, sales and marketing teams need to collaborate and synchronize their efforts to achieve a common goal. Today, more than ever, the success and productivity of an organization are correlated to the alignment of their sales and marketing departments and team members. In fact, according to Act-On‘s 2017 B2B sales and marketing alignment report, 56% of aligned organizations met their revenue goal and 19% beat their goals while only 37% of misaligned organizations met their revenue goal and 7% beat their goal. The goals of both sales and marketing are to generate revenue for their organization. However, the methods the two departments employ for pursuing this common goal differ. In the age of digital marketing, the top priorities and activities for marketers are to create brand awareness, convert leads into customers, grow website traffic, and boost revenue from existing customers. On the other hand, top sales priorities are acquiring new accounts, closing deals, customer retentions, and upsells. The objectives of both departments, if executed properly, will contribute to an increase in an organization’s revenue and ROI. There are many benefits in B2B sales and marketing alignment. The numbers speak for themselves! 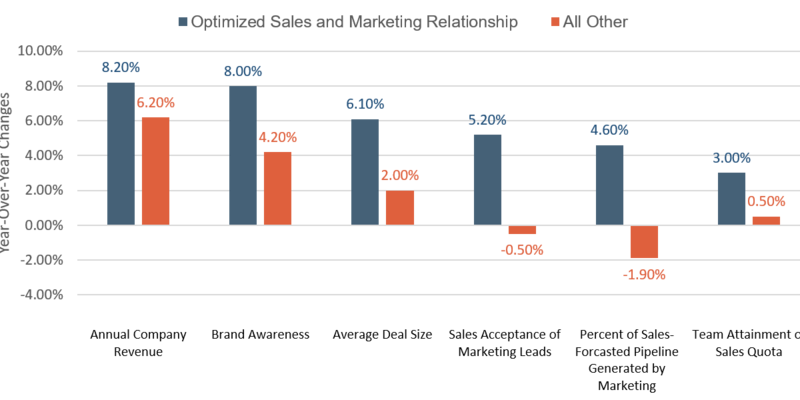 According to a study performed by Aberdeen Group in 2016 organizations that optimize their B2B sales and marketing alignment not only saw an increase in productivity but also grew their revenue 32% faster, as well as saw a higher growth in brand awareness, average deal size, sales acceptance of marketing-generated leads, attainment of team quota, and percent of sales-forecasted pipeline generated by marketing. Well-aligned sales and marketing teams produce 36% higher customer retention rates and 38% higher sales win rates. B2B sales and marketing alignment brings about many benefits. The alliance between the two departments leads to smoother business processes, goal alignments, and shortens the sales cycle. The first and most important step an organization can take to initiate such an alignment is to invest in tools and technology for a better communication between sales and marketing departments. 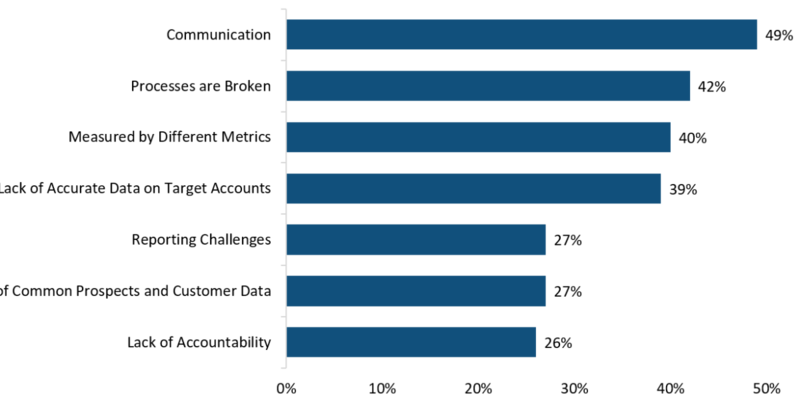 49% of sales reps and marketers believe communication as their number one challenge, followed by flawed processes and misaligned metrics. 54% of sales teams in North America want to make it easier to close deals by improving the efficiency of the sales funnel. As mentioned earlier, sales and marketing have different goals and measure different metrics for attaining these goals. Nevertheless, both departments’ ultimate goal is to raise revenue and improve ROI. Therefore, it is imperative to the success of an organization for top-level management to provide a tool that drives collaboration and feedback between their sales and marketing departments. In order to bridge the gap between marketing and sales, an organization needs to create a real-time pipeline for communication that actively encompasses the flow of actionable information between marketing and sales teams. Such a pipeline should act as the single point of access for all communications and marketing resources to help the sales team perform at their highest capacity. 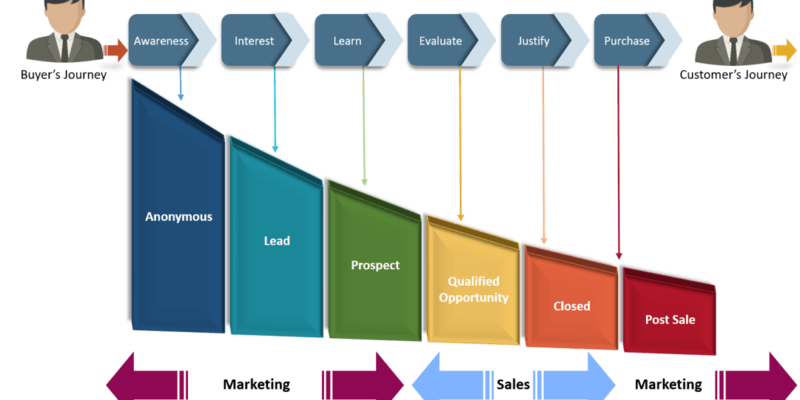 At the same time, such a pipeline needs to give the sales teams the capability to provide the marketing team with feedback on the suitability of materials at different stages of the funnel. A robust partner portal that can be integrated with an organization’s CRM software and marketing automation platform will help both the marketing and sales teams to have access to such crucial sales and marketing data needed to view progress and stay on track toward goals. Computer Market Research (CMR)’s PartnerPortal provides organizations with a standardized and streamlined way to register basic information, share business practices, create sales and marketing programs, audit and manage distributor claims, and more. CMR’s PartnerPortal platform creates a unified online intelligence hub for all marketing and sales enablement tools and documentation. This portal allows different departments and channel partners to efficiently work together on the planning and execution of sales and marketing activities. A single point of access to all channel data and real-time analytics, this means sales and marketing teams can have access to the same up-to-date information. CMR’s marketing automation platform, MioDatos, provides sales and marketing teams a better visibility into how prospects and leads move through the sales funnel. Once an organization’s sales and marketing teams are communicating and collaborating on how to effectively interact with the buyer, they can expect to beat their competition and at the same time anticipate the customer’s next move and needs.